DENVER – Welcome to competition season with a cast of characters unlike any that have graced a television screen before on Outdoor Channel, Sportsman Channel and World Fishing Network. Viewers will be keeping their eyes on the prize, as the highly-anticipated debut of adventure competition series, The Brigade: The Race to Hudson presented by Bass Pro Shops and Cabela’s debuts on Monday, April 22 at 8 p.m. ET/PT. The Q2 programming lineup debuted Monday, April 1 and fans began to catch original premieres and new episodes from returning series across all three networks. 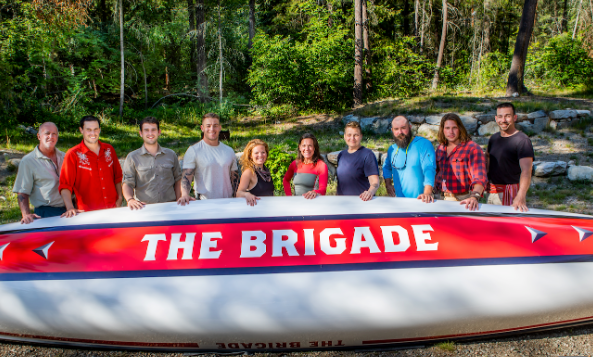 The Brigade: Race to the Hudson (Premieres Monday, April 22, 8 p.m. ET/PT): This cooperative competition forces participants to work together as they travel 750 miles across the York Factory Express – an historic fur trade route legendary for its danger, isolation and beauty. The Brigade is not about eliminating foes, it’s about hanging on to every member against the odds. Voodoo Crew (Premieres Monday, April 29, 7 p.m. ET): From the producers of “Pigman: The Series” comes a new series following the day-to-day operations of the Voodoo Charters company out of Venice, Louisiana. For Love or Likes (Premieres Thursday, April 4, 7 p.m. ET): Ladies with a large social media following struggle to prove whether they are in it for the love of the outdoors – or just to get more “likes.” Unique challenges will put their outdoor skills to the test. Major League Fishing (New Season Continues Saturday, April 6, 2 p.m. ET): Brings fans the high-intensity sport of competitive bass fishing in the form of two-hour television episodes with 24 world-class anglers filmed over the course of a six-day event. 1 p.m. ET). Kayak fishing continues in popularity and Sportsman Channel has the shows to prove it. Tune in to Knot Right Kayak Fishing (first half of the quarter) and Extreme Kayak Fishing Challenge (second half of the quarter) on Sundays at 2:30 p.m. ET. Finally, don’t miss the continuation of amazing hunting and family bonding time on Everything Eichler (Sundays, 12:30 p.m. ET). Unfathomed (Premieres Sunday, April 6, 1 p.m. ET): Unfathomed is cinematic storytelling with a focus on appealing destinations, intriguing personalities and quality fisheries in the United States and around the world. Extreme Kayak Fishing Challenge with Jim Sammons (Sundays, 2:30 p.m. ET – first half of the quarter): Jim Sammons is recognized worldwide as a pioneer of big-game kayak fishing. He owns and runs La Jolla Kayak Fishing guide service and has become the most recognizable kayak angler in North America. Knot Right Kayak Fishing (Sundays, 2:30 p.m. ET – second half of the quarter): The only thing Chad Hoover enjoys more than catching big fish is exploring and finding fish where power boats can’t reach. Hooked on Africa (Sundays, 8:30 p.m. ET): Featuring the wildest fishing to be found in Africa and the Indian Ocean. Reel Animals (Sundays, 7:30 p.m. ET): Charter Captain Michael Anderson explores the scenic coastal waters of the Southeastern United States and Costa Rica for fish and fun. Facing Waves (Sundays, 6 p.m. ET): An inspiring series that follows top paddlers as they explore the people, places and adventures of the world’s top paddling destinations. Mutiny (Until April 15, Mondays at 8 p.m. ET): Join the mutiny for an epic, 5-part mini-series that recreates the heroic boat voyage of Captain Bligh and his loyal sailors after the mutiny on the Bounty in 1789. Shootout Lane (Premieres Wednesday, April 3, 7:30 p.m. ET): An atypical southern family of world-champion competitive shooters and custom gun manufacturers take on their own family members and the world from the Louisiana compound where they live. The Hunt for Monster Bass: Tune in on Memorial Day, Monday, May 27 from 7 p.m.–midnight for five hours of one man’s obsession to catch the largest of the bass species. Other favorites returning on Sportsman Channel with new episodes include: Pigman: The Series (Sundays, 8:30 p.m. ET), Petersen’s Hunting Adventures (Sundays, 9:30 p.m. ET) and Long Range Pursuit (Mondays, 10:30 p.m. ET). Gypsy Angler is returning and renamed Ray Van Horn’s Captain’s Journey (Saturdays, 9:30 p.m. ET) with new episode as Captain Ray Van Horn searches for unique fish species in both saltwater and freshwater. Other notable series with new episodes include: The Bass Pros (Sundays, 3:30 p.m. ET), Ultimate Match Fishing (Mondays, 8:30 p.m. ET) and Lunkerville (Tuesdays, 10:30 p.m. ET).